The Office of Development seeks to promote the Mission and Vision of the College, and partners with donors to maximize the impact of their gifts. 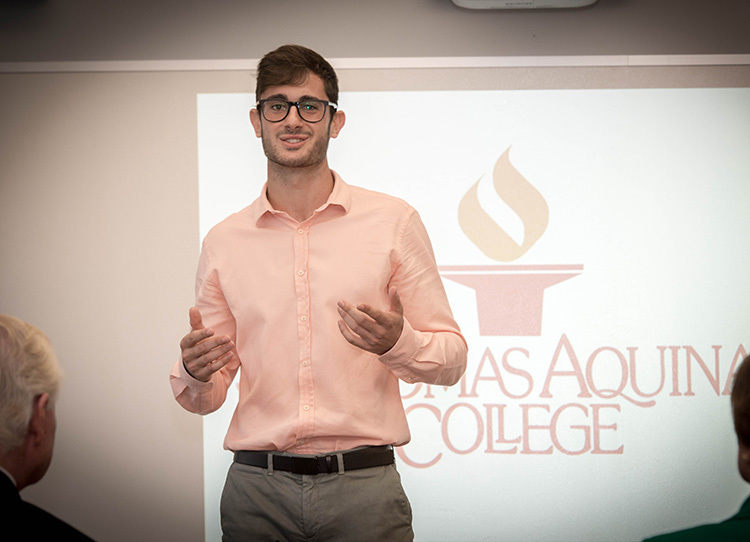 Pictured above is Javier Munoz Laguna, Class of 2017 scholarship recipient, who presented at a classroom dedication for one of the College's benefactors. Endowments form a long-term foundation for student, faculty, and institutional growth and development. Nearly 86% of St. Thomas Aquinas College students receive some form of financial aid. Every student should have access to a life-changing, quality education. Create a new scholarship fund or contribute to a current fund. A planned gift made through a will or trust to STAC is a gift that can help ensure the long-term financial stability of the College while providing you with the opportunity to become part of STAC’s future. It enables philanthropic donors to make larger gifts than they could make from their income. We would like to help you consider this kind of gift while planning for your financial future. Learn more about your planned giving options. There are many ways to support St. Thomas Aquinas College through program and/or event sponsorship. From larger events, such as the Annual Black-Tie Gala and Annual Golf Tournament, to lectures, panel discussions, and networking events, there are a variety of ways to support the College and our students. The President’s Council is a talented group of Alumni, Business Professionals and Community Leaders who provide thoughtful counsel and leadership to help St. Thomas Aquinas College fulfill its educational mission. Visit the President's Council page to learn more.